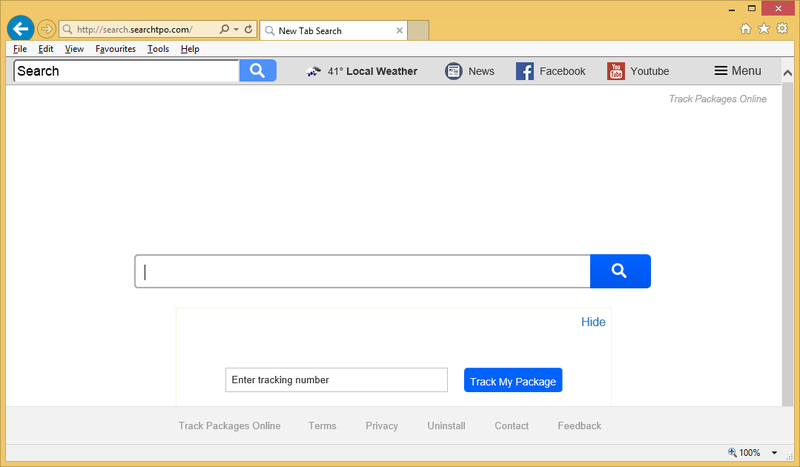 Search.searchtpo.com is a redirect virus, commonly known as a browser hijacker. Hijackers are quite wide-spread and most users have probably encountered it at least once. They are attached as additional items to free software, which allows them to install alongside. You can prevent them from installing by paying closer attention to how you install programs and making sure you deselect everything that has been added to them. The good news is that it does not directly damage your computer. Hijackers are designed to make money by redirecting you to sponsored pages and to make doing that easier, they change browser’s settings and set their domains as your homepages. The redirects can be quite troublesome, not to mention somewhat dangerous. Seeing as hijackers do not care about your computer’s safety, it could easily lead you to infected sites, where you could download malware. If you do not want to risk it, delete Search.searchtpo.com. If you are stuck with Search.searchtpo.com as your homepage, that means you do indeed have a browser hijacker infection on your hands. It has changed your browser’s settings without your permission and will now attempt to redirect you. It should be noted that the setting changes are irreversible until you remove Search.searchtpo.com because it will just keep changing them back otherwise. On the page, you will see a search box, which will lead you to Saferbrowser Yahoo if you use it. Sponsored pages will appear among the results because the hijacker aims to redirect you. You will end up on all kinds of sites, some of them will have little to do with what you were searching for. Some could even lead you to malicious pages where malware is waiting for you. You could end up with a serious infection if you are not careful. To prevent possibly serious outcomes, delete Search.searchtpo.com. You may already be familiar with the way hijackers spread, as they all use the same method. It is called the bundling method and what that means is that hijackers are attached to free software as extra items that you can choose to install. To prevent these unwanted installations, use Advanced or Custom settings during freeware installation. If there is anything attached, you will see it there. All you have to do to prevent added items from installing is uncheck the boxes. Only then should you proceed to install the freeware. Unless you want to be stuck having to uninstall Search.searchtpo.com or simialr again. If you want to avoid serious consequences and wish to remove Search.searchtpo.com, we recommend obtaining anti-malware software. The program of your choice would locate the issue and make sure to erase Search.searchtpo.com fully. You can also pick to eliminate Search.searchtpo.com manually but that would take more time as you would need to do everything yourself. Make sure you take care of Search.searchtpo.com removal fully because it might renew itself again.